Guess Who’s Coming with Dinner? In 1646, two now-Virginia tribes signed a peace treaty with the British powers, ending the Third Anglo-Powhatan War. With this, the first reservations (the legal designation for an area of land managed by a Native American tribe rather than the state government) were created. The treaty also exempted the Pamunkeys and Mattapoin indigenous people from taxes, as long as they offered tributes to the governor each year. These gifts varied from beaver pelts to ducks, to rockfish, deer, and turkey. More than three hundred and fifty years later, the yearly tribute is still delivered. 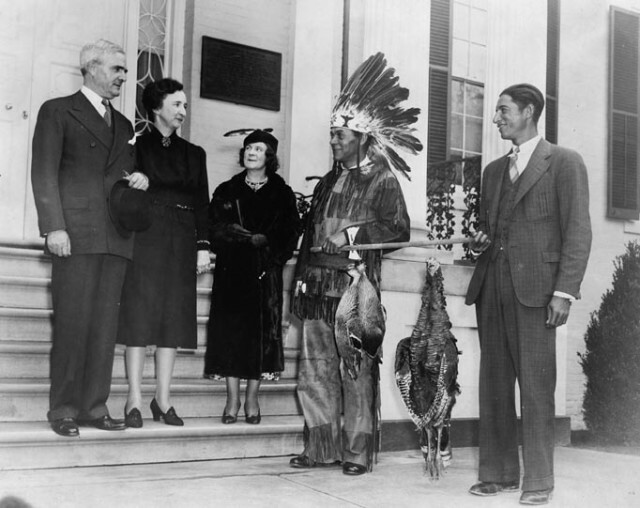 Each fall, the chiefs of the two tribes travel to the Governor’s Mansion at Ninth Street on Capitol Square to offer game in lieu of taxes. Here, two member of the Pamunkey tribe offer their tribute to Governor James Price who served the Commonwealth from 1938 to 1942. The Pamunkeys were the largest and most powerful tribe of the Powhatan Confederation when the British settlers arrived and still hold the King William County reservation that was established in the 1646 treaty. This past July, the Pamunkeys became the first federally recognized tribe in the Commonwealth of Virginia.